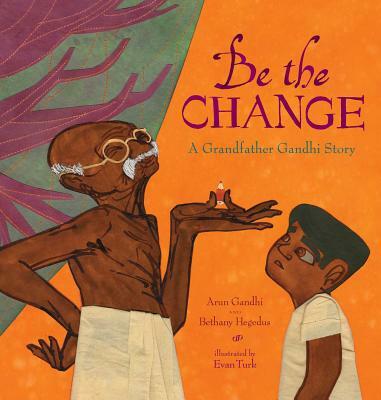 In this breathtaking companion to the award-winning Grandfather Gandhi, Arun Gandhi, with Bethany Hegedus, tells a poignant, personal story of the damage of wastefulness, gorgeuously illustrated by Evan Turk. At Grandfather Gandhi’s service village, each day is filled, from sunrise to sunset, with work that is done for the good of all. The villagers vow to live simply and non-violently. Arun Gandhi tries very hard to follow these vows, but he struggles with one of the most important rules: not to waste. Arun Gandhi, born in 1934, is the fifth grandson of Mohandas K. Gandhi, also known as Mahatma Gandhi. He was a journalist for more than thirty years for the Times of India and has written for The Washington Post. His first of two books for children was Grandfather Gandhi. Currently, Arun serves as president of the Gandhi Worldwide Education Institute and travels the world speaking to governmental leaders, as well as to university and high school students about the practices of peace and nonviolence. He lives in Rochester, New York. Visit him at ArunGandhi.org. Bethany Hegedus is the author of Between Us Baxters and Truth with a Capital T, as well as the coauthor of Grandfather Gandhi. She owns The Writing Barn, a writing workshop and retreat center in Austin, Texas. She teaches widely and speaks across the country. Visit her online at BethanyHegedus.com.